JL and I are trying to be good and do our unofficial WW again. Since counting points is difficult to do we have been trying to come up with more snacks that are decent. JL decided he wanted to get some celery for the crunch factor. One day he decided to make ants on a log with peanut butter. I suggested to him to try cream cheese since it was lower in points and would be something good from my childhood. NHL was lurking at snack time that day. He decided to try the red ants on a log (cream cheese log with dried cranberries). 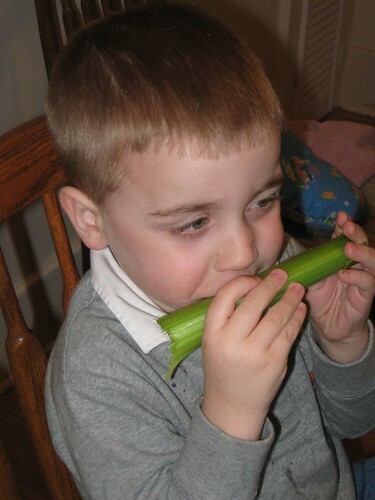 Soon after he decided that as much as he liked that, he preferred the celery all alone. 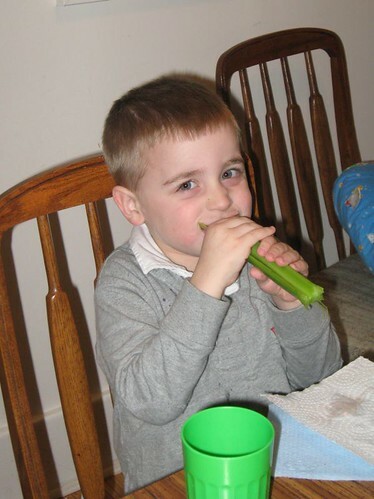 So here is my strange 4 year old eating his dessert of celery the other night. Not the best photo, but shows the huge hunk of celery that he selected over other desert choices. He kept telling me that this was tasty. Plain? I do not think so, but whatever floats your boat kiddo! Trying to hide his mouth behind the celery so I could not see him laughing and smiling. Mind you I should not be surprised that my child is strange, after all I am the weirdo that does not really like chocolate. Go figure, right? No need to worry though, he received the dominant chocolate eating gene from his daddy! « Knitting fool – c’est moi! Renee: Definitely try those with the kids. I like it as something different and less fattening than PB and raisins on it. 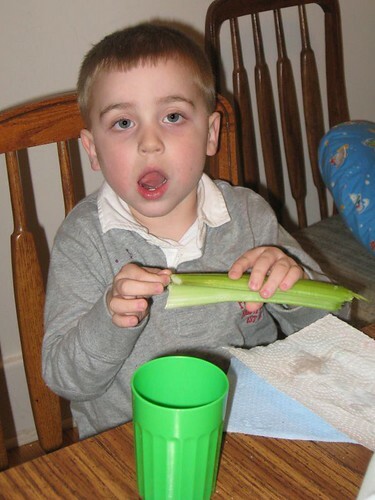 The strange thing is I do not recall Noah enjoying celery before this. I seem to remember that at Passover he would not try it during our Seder. I guess the good thing is he is willing to re-try things and give them a shot without always being pig-headed about it. 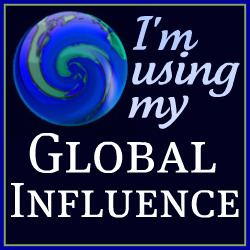 Andrea: Thank you and welcome to my blog. I still think those Straplettes are a great idea. Mind you if my almost 8 month old keeps biting me, he will be weaned soon. The little monster is getting to know his two newest teeth and got me three times tonight. GRRRR! OK..something IS wrong with that kid LOL! Now, how much should we bet in a couple months he once again will not touch the stuff. Kids! Too Funny! Sandra: Definitely not my child with the celery thing. If I eat it it must have something on it. . . hummus works for me even. I agree soon enough that food pick will be gone and once again the celery will not interest him. That is why I took photos of it to prove that he would eat it at one point in time! I wish I could choose celery for dessert! That’s so great! It’s amazing he’ll eat it plain like that! He’s going to be big and strong! Shawna: Me too, although there are other veggies or fruits that I would prefer. My latest thing are frozen cherries. They are good for you and taste like ice cream with a lot less guilt! kailani: We shall see how long it lasts. 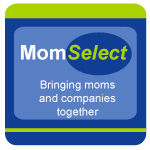 As you know, the taste preferences with kids come and go quickly.